Stump Cross advertised their Haslem-Sheppard Halifax AFL title credentials with 9-0 mauling of next-to-bottom Sowerby United. Sowerby had them on the back foot in the early stages but never threatened to score. Stump showed them how it was done with their first attack. Tom Robinson’s corner kick was met by Adam Barlow, who scored with a great header. Sowerby were still giving as good as they got but a second goal and one each side of the break took Stump well clear. Sowerby hearts sank and their only bright moment came when Matt Bridges produced a great save to keep out Barlow’s spot kick. Damian Watkins finished with a hat-trick for Stump while there was a second for Barlow and others for Robinson, Chris Gent, Josh Hiley and Martyn Bates. Midgley United continue to set the pace and their 3-1 win at Northowram probably ended the title hopes of their hosts. The Rams had lost at home to Ryburn the previous week and they were beaten by a no-nonsense Midgley in a scrappy, attritional game in which defences dominated and neither keeper had a save to make. Midgley took the lead after 17 minutes with a neat first-time back heel from Danny Pullan following a corner driven in low. Pullan missed a great chance but Jason Cartlidge’s looping header doubled the lead three minutes before the interval. Booth, on one of the rare occasions he escaped Matthew Rushworth, was desperately close to adding a third with a neat lob from distance. The Rams battled hard but got little change from hard-working, committed opponents who were quick to close them down. A superbly-struck rising drive into the top corner by Alex O’Keefe was the perfect boost for Rams two minutes into the second half and they upped the tempo. Midgley took the sting out of any threatened comeback and made the game safe on 70 minutes when Booth, sliding in, was first to Toby Standring’s cross. Calder ‘76 got back the three points they had deducted last week with a 3-1 home win over Greetland. Rob Kenworthy’s side, who played Gav Martin when he should have been suspended in a win over Ryburn, took the lead midway through the first half through James Megson in a scramble in the box. Carl Ainley made it 1-1 with a good finish from a flowing Greetland move. Ricky Topham restored Calder’s lead 10 minutes after the break and the hosts sealed a deserved victory in bizarre style when a clearance from the Greetland ‘keeper hit his own defender, James Highley, on the backside and rebounded into the net. Hebden Royd Red Star picked up their first win of 2015 after an early scare away to bottom side Elland United. Elland scored in the first minute and were 2-1 up midway through the first half, goals from Martin Boon and Adam Goldthorpe being split by one from Eddie Harvey following visiting player-manager Chris Garbutt’s cross to the back post. The hosts played the better football in the first half but Star had the better chances and the Elland goal led a charmed life. However, James Chadwick hauled Star level after Lewis Cockroft’s effort had been saved and Eddie Harvey curled the ball into the top corner from Pat Thomas’s through ball to make it 3-2 to the visitors at the interval. Red Star pulled clear in the second half. Thomas chipped the ‘keeper from Cockroft’s through ball; Cockroft rounded the ‘keeper after Chadwick had flicked on Joe Kidder’s long kick; Dan Lumb’s header from a corner was deflected in; and the ball ended up in the net after a 50-50 challenge between Eddie Harvey and the home custodian. Shelf United made it two wins out of two since a lengthy break with a 5-2 success away to Copley United. Shelf had the better of the opening quarter but missed chances and their only reward came from a Billy Grogan half-volley from Adie Baldwin’s ball over the top. Copley improved in the run up to half time and Scott Davies’s snap shot beat Daniel Gill to make it 1-1. Shelf took control in the final 30 minutes after sending on central midfielder Danny Thornton, although they were helped by a couple of freak goals. A low Grogan corner went under the ‘keeper and a defender on the line kicked the ball against the ‘keeper, the ball finishing up in the net for 1-2. Thornton’s half-volley rounded off a Shelf move which involved numerous passes and Grogan bagged two more, although the ‘keeper looked to have the free kick for his third covered until the ball hit a divot and went over his head. Copley had the final word when Gary Ash beat the offside trap with five minutes left. Ryburn United, boosted by their three-point bonus from the Calder fixture, have shot up to third on the back of Saturday’s 2-1 win over Warley Rangers. Owen Wilkinson and Macauley Peacock scored for the winners. It was a good day for Mixenden United, who crushed Stainland United 8-1 while Division One title rivals Holmfield could only draw 3-3 at home to Ryburn United Reserves. Mixenden scored four goals in each half at Stainland Rec, the hosts replying through Joel Wood midway through the second half. Ash Bailey capped a man of the match display in the Mixenden midfield with a hat-trick and Adam Gaze also bagged three goals. The other two came from Damian Randall and included a superb lob over the home ‘keeper. Richard Redhead was a thorn in Holmfield’s side, scoring twice for Ryburn Reserves. The leading pair look to have the promotion places between them after third-placed Salem slipped again, this time by 7-2 at home to Sowerby Bridge. Luke and Dayle Maguire scored five goals between them for Bridge, who have rattled up a quick hat-trick after a lengthy break. Greetland Reserves are also enjoying an upsurge in form and picked up a seventh point in three games with a 2-2 draw at home to Volunteer Arms. Greetland had the better of the first half and Volunteers had most of the play in the second. Andy Hurcombe opening the scoring after a super defence-splitting reverse pass from Craig Hare. When Hurcombe’s shot was well saved, the ‘keeper couldn’t hold on to the ball and Luke Whitworth tapped home his first goal for the club. Greetland Reserves seemed in control, particularly when Arms were reduced to 10 men through an injury, not having any substitutes. However, Matthew Tagg gave them hope just before half time with a well struck left-footed effort into the roof of the net. Volunteers put the hosts under a lot of pressure and Lee Smith equalised with 20 minutes left. Both sides had chances to win it late on but a point each was probably a fair outcome. Two goals from James Balmforth helped Midgley Reserves to a 3-2 derby win over their Calder ‘76 counterparts while there were two goals apiece for Nathan Sloane, Craig Gladwin and David Maguire in AFC Crossleys’ 6-4 win away to Halifax Irish Centre. 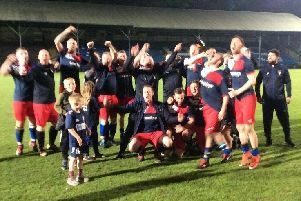 Division Two title combatants Brighouse Sports and Illingworth St Mary’s flexed their muscles with wide-margin wins. Leaders Brighouse crushed hosts Sowerby Bridge Reserves 11-1 at Walton Street with leading scorer Bohran Doski bagging another four goals and Connor Durkin and Chris Allen getting two each. Illingworth had eight different scorers as they made it 11 wins from 11 games with a 9-2 home success against Sowerby United Reserves. Jake Griffin contributed two goals. Denholme United Reserves leapfrogged Shelf FC into third place with a 2-1 win over those rivals, Damien Allen and John Judson getting their goals. A Paul Glew hat-trick got Northowram Reserves back to winning ways, by 3-2 away to AFC Crossleys Reserves, while Ross Broadley’s two goals helped Shelf United Reserves get the better of visitors Salem Reserves by 4-3.